Last Saturday was an action packed one as work got underway transforming the new school allotment. It was a triumph of team work, dedication and determination as the foundations were laid to transform a scruffy patch of grass into a productive vegetable and wildlife area. It was wonderful to see so many families from the school come together with one common purpose in mind: to provide something better for their children. It was lovely to feel support from the wider community too. Local residents popped down to say hello, dropped off tools and tins of biscuits. Work on site began early with the children helping to set out using string and pegs. Together, they carefully measured the space for the wildflower area before marking it out. Even those as young as five were keen to help, with this little one in the picture below reeling the string off the roll. The children at Oakridge are a practical bunch. It was refreshing to see so many little bodies getting stuck in getting their hands dirty. The older ones helped the younger ones not only with the tasks at hand but also with words of encouragement. There was a lengthy task list. 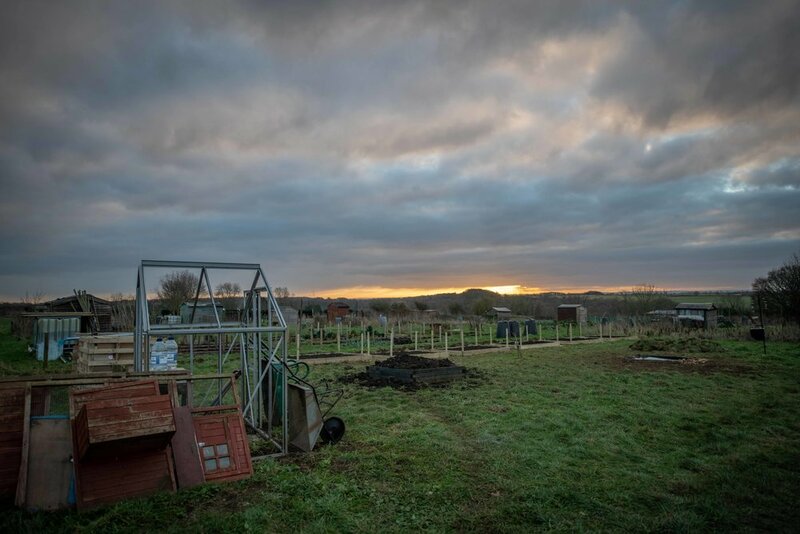 Key jobs included digging over the grass for the wildflower area, making the raised vegetable beds, building the compost heaps, erecting the greenhouse and digging out the pond. It was this last job that proved the most challenging. The soil in the area is notoriously stoney and after just a few minutes of digging the Dad’s soon reached bedrock. Not to be defeated and with pick axes at the ready, the hole gradually began to take shape. Small pockets of parents tasked themselves with different jobs. Alongside the pond building, another team built the raised beds. All the timbers were very generously donated by Jewsons in Stroud. There was over £200 worth of wood so it was extremely kind of them. They even delivered it all for free. The local and wider communities have been so supportive of the school’s allotment project. 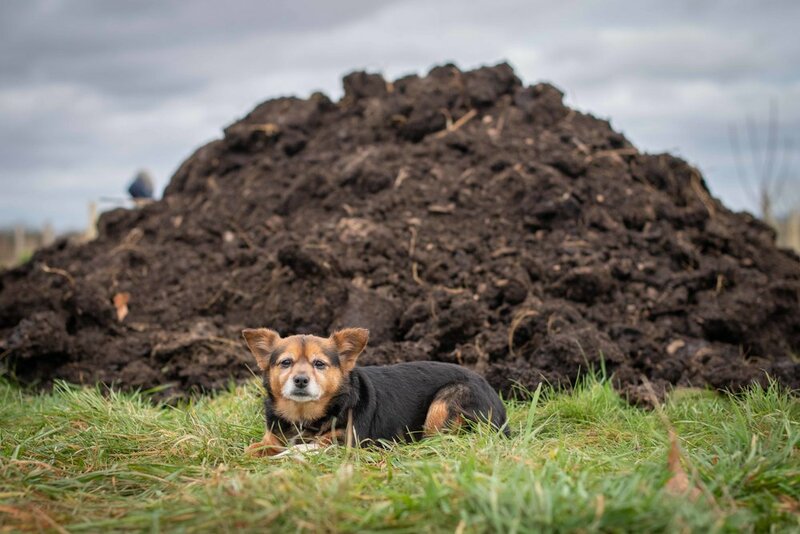 As well as all the free timber, a local resident offered to deliver a whole heap of manure too - free of charge. Others have donated gardening tools and made cash contributions. All of these things will go such a long way in making sure the allotment is a huge success for the children both now and in the years to come. As parents we have a responsibility towards our children not only to keep them safe but to give them the freedom to judge risk for themselves - a vital quality to possess. Being outside in the fresh air, feeling at one with the countryside and doing some manual labour teaches so many valuable lessons. It sure beats the screen time that so many children seem to crave these days. …the very small ones enjoyed eating chocolate biscuits. There were a total of six raised beds. All were marked and measured out before being cited into position. Cardboard was placed underneath each one to create a natural, organic membrane between the wood and the grass, on top of which tons upon tons of compost, manure and soil were placed. The soil that came out of the hole for the pond was reused in the raised beds. Given how stoney it was one volunteer had the bright idea of sieving it prior to it going into the beds. This was a remarkably successful technique. To help keep motivation high there was a lovely big fire pit. Folk caught a whiff of the smell of sizzling sausages as smoke soared into the wintery sky. The scrumptious food was a warm welcome after a hard morning’s work. For all the work the children did, equally there was plenty of play too. The compost bins made great dens and parents would often peer into the top of one to find half a dozen children inside with Saphie the dog on their laps feasting on chocolate biscuits! The allotment is a beautiful space. Surrounded by open fields and big skies, there is a real sense of peace and tranquility. There are many parents in the school who are looking forward to using it as a place to come and picnic in the Summer months, to chat and gather with friends, perhaps garden together or simply sit and enjoy the countryside. It was a rather momentous moment when the first buckets of water were poured into the pond. It took nearly the whole day to grind the hole out of the rocks, there was great cheer as the water flooded the cavity. All of the waste materials dug out of the ground were reused in other ways. For example, the soil from the hole of the pond was dug into the raised beds, the rocks were reused to make a hibernaculum, (reptile house) and the grass from the wildflower area was used to cover it. In time the hope is that the grass will start to grow therefore forming a seat for the children to sit on. The greenhouse was erected in one corner of the site. It is without glass, (for obvious safety reasons) and instead the open sides will be filled with plastic bottles. This is a future project for the children, in the mean time, parents have been asked to start collecting lots of 2 litre bottles - it’s going to need a lot! There was plenty of fun and cheer to be had, even as the sun was setting. Children have a stamina that just goes on and on, it’s wonderful! As with everything, this is a work in progress. Once the wildlife area is planted up and the grass recovers it should be bursting with life and colour. The hibernaculum will be enhanced with the addition of corrugated sheets that will provide a habitat for grass snakes etc. The turfs of grass on top will hopefully root and once the grass takes will provide some much needed seating for lessons. The children will help plant up the pond, which will provide an endless resource of learning for them over the coming months and the bird feeding station will become the focal point of the school’s RSPB Big School Bird Watch, which is happening in early February. The six raised beds will be where all the vegetables are grown. The school has decided to adopt a no dig method, which means the soil is left undisturbed and in turn makes for stronger, healthier plants. The first vegetables the children will be planting are broad beans and they can start planting these over the next few weeks. They can also start to chit potatoes. The school is very excited about how the vegetable garden will support the children’s diets at school, particularly at lunch time. Now that the first phase of the allotment is complete, phase two is already underway. 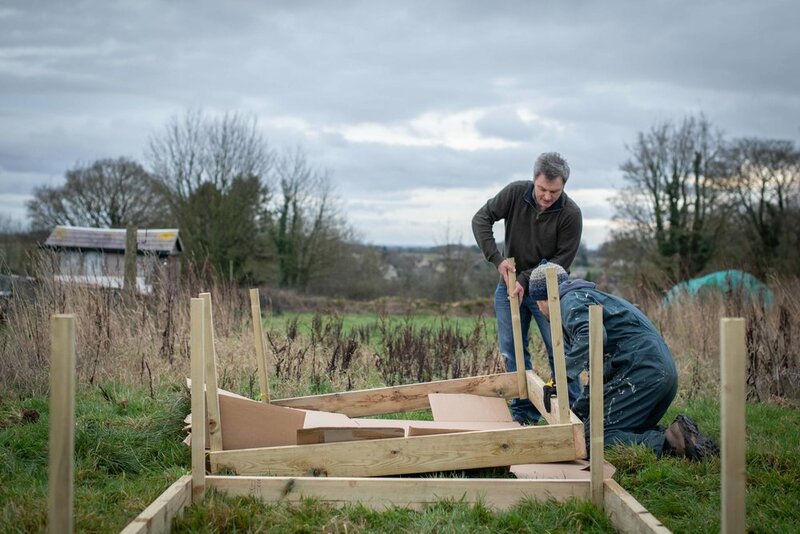 Plans include building a willow fence around the perimeter of the plot as well as the pond and wildlife area, building a sunken fire pit, erecting a shed, building the plastic bottle greenhouse and buying a large work bench for class lessons. Fundraising continues and if you would like to donate please go to https://rocket.fund/p/oakridgeallotment/. After school gardening club starts tomorrow. The first two sessions will focus on building bird hides out of old Christmas trees in readiness for the RSPB Big School Bird Watch the children are doing in February.